LOVE AND HATE FEY GUY AGO TONY GUILT NIL. You and your opponent take it in turns to pick a word until one of you has collected three with a letter in common. Whoever does so first is the winner. You lose the toss and your opponent snaps up LOVE. Assuming him to be a master at the game, what must you take to stop him winning? This Python 3 program plays the game with appropriate strategies for the players. Player 1 is a perfect player, and will prefer to make a play that guarantees him a win. If that is not possible he will try to make a play that guarantees the opponent cannot win. Player 2’s strategy is to try and make a play that prevents Player 1 from winning. The program explores all possible moves that conform to the above strategies, but we could simplify it so that the strategies determine a single “best” play in any situation, and not to track the actual sequence of moves. As it is, this program executes in 755ms. # is sequence <s> a winning sequence? # are there choices that ensure a player 1 win? # are there choices that exclude a player 2 win? # are there choices that exclude a player 1 win? Solution: Player 2 must play TONY in order to stop Player 1 from winning. We see that the game is equivalent to Noughts and Crosses (see [ https://en.wikipedia.org/wiki/Tic-tac-toe ]). In the situation described in the puzzle, Player 1 chooses a corner square (LOVE), so the only situation in which Player 2 can force a draw (if Player 1 is a perfect player) is by playing the centre square (TONY). If Player 2 plays an edge square next to Player 1 (say NIL, but playing FEY will play out similarly) then Player 1 will respond by playing the centre square (TONY). Player 2 must then play AGO in order to stop Player 1 from winning on the next move, and Player 1 can then play HATE to acquire 2 of the E words and 2 of the T words. Player 2 cannot stop Player 1 from acquiring one of the remaining words required to make a line, so always loses in this scenario. If Player 2 plays one of the other edge squares (say AND, but GUY will play out similarly) the Player 1 responds with the centre square (TONY). Player 2 must play AGO, and Player 1 plays HATE, giving him the option of FEY and GUILT to win on E or T, and Player 2 cannot block both these. So Player 2 always loses in this scenario too. If Player 2 played one of the remaining corner squares, then Player 1 can respond by playing a corner square and can force a win. So the only scenario in which Player 2 can do better is to play the centre square (TONY) and force a draw. As the program shows there are 82 possible games that start with LOVE and TONY and all end in a draw. Doesn’t Player 1 win with Love,Tony by playing the corners Guilt then Hate and finally Ago. 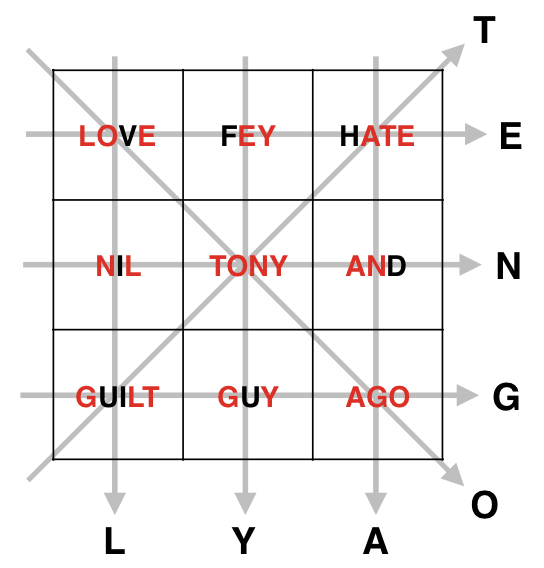 Player 1 can’t win by playing LOVE, GUILT, HATE, AGO, because no 3-subset of those 4 words have a letter in common. Also, if the game sequence was 1=LOVE, 2=TONY, 1=GUILT, then Player 2 would be forced to play NIL (to stop Player 1 from completing the L line). If Player 1 then played one of the remaining corners (HATE or AGO), Player 2 could play AND to win along the N line. Or are you suggesting that if the game opens with Player 1 taking a corner, and Player 2 takes the centre square, then if Player 1 can acquire the remaining three corners, on his final go he will be guaranteed to make a line by playing the last edge square? The flaw in this scheme is that while Player 1 is acquiring the corners, Player 2 is collecting the edge squares, and by the time he has the centre square and 2 or 3 edge squares he will have collected a line and won, so Player 1 will never get to make his final move. Yes, the latter but you immediately demonstrated my error of not considering the obvious rules of the game. So I had the correct answer after all and was talking myself out of it.